You made it Sunday, our rest day of the week. Take a day off, sleep in and rest up for tomorrow. 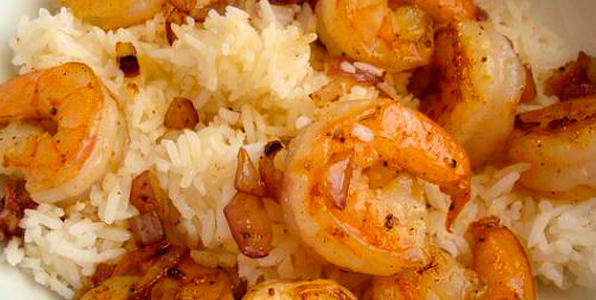 If you have some free time and want to make an amazing meal, try the Fried Egg Garlic Shrimp. When I was in college, my training partner Drake Parker was from the Kaneohe (west shore of Oahu, Hawaii). I spent the summer with his family and got to see Hawaii through a local's eyes, and this is where I developed my love of Poi and plate lunch. Garlic shrimp is a plate lunch staple in Hawaii and the west side of Oahu is world famous for shrimp trucks serving garlic shrimp. Since I only get to Hawaii every so often, I had to create a recipe that pays homage to those days. And the egg on top, is just for good measure. Start by cutting the tops off 2 heads of garlic to expose the cloves. Pour four teaspoons of olive oil on the garlic heads and roast at 400 F till soft (approximately 35 minutes). When it cools, squeeze the garlic into a bowl. Mash with another teaspoon of olive oil and put it aside because this our sauce. Once shrimp is cooking on final approach, heat another small skillet and toss coconut oil in. Once the coconut oil pops, crack egg into the pan and cook sunny side up. Start with the remaining 2 heads of garlic, mincing then into cloves. Heat one large skillet over medium-low. Add the olive oil, 1/2 stick of butter, and minced raw garlic. Cook the garlic on low until softens. Then add the wine, roasted garlic, salt, pepper, Old Bay, paprika, remaining butter, and the juice of 2 lemons. Continue to cook on med-low until the mixture thickens. Layer the shrimp in the pan, and turn the heat to medium cooking the shrimp for 3 to 5 minutes. Once the shells have turned pink, flip them. Turn the shrimp over and cook for another 2 to 3 minutes. Turn off the heat and allow the carry over heat of the sauce to finish the shrimp. Do not over cook or they get tough and nasty. Toss and stir shrimp into garlic sauce. Serve with white rice, lemon wedges and egg on top, and as always, this serves one. i literally just ate 7lbs of food.